Are you a Spontaneous or Planned Runner? 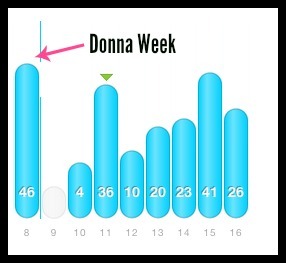 Since 26.2 with DONNA, I’ve been in this zone that’s part recovery/part maintenance/part buildup for my next training cycle (for Chicago) which will begin on June 9. You see, after the marathon (which I had trained for with a modified Hanson’s plan, due to time constraints) I took my prescribed two weeks off of running (it just looks weird on this graph the way the weeks fell) before coming back with easy, mid-length runs. I ran either sans watch or music to pay attention to the “feel” of the run, instead of focusing on pace, and timing-wise, was able to really enjoy the Sarasota Half Marathon and even set a PR in the 5K distance. That was just the boost that I needed to gauge my fitness level, and since, have been working to keep a baseline mileage, as well as free up extra time to devote to some cross training and core strength building. Last weekend, I did another double race weekend and hit my second-best 10K time and a decent half time (4th best of 15 half marathons), to boot. I felt good, and strong, so you’d think that I’d be satisfied with my state of running. Well, to be perfectly honest, I really am not. I mean, I am still proud of how things have been going this year, don’t get me wrong. Running and racing-wise, it’s been a confidence-building experience – and let’s be real, laying down nearly 19 miles (18.64 miles = 30 kilometers) just for fun, and without dying – that was pretty awesome, too. But, deep down, I know that the reason I am not feeling totally on track with my running is simple: I have no plan. I was REALLY trying to just “go with the flow” these past few weeks (especially since once the summer begins, it’ll be nonstop training through DONNA 2015) setting out for “x” amount of miles “x” times a week – and I wasn’t totally unsuccessful with it (except for the week we went to Austin – and the few days after we got back, haha) but this time without a plan showed me one thing – I “feel” best when there’s a specific run written out for me, that I can cross off in my day planner (literally). And you know what, that’s okay. That’s me. It might not be what works for everyone, but in my four years of running (I’ll celebrate my runniversary this summer!) it’s a lesson I’ve learned. So, I am excited to announce that I’m the proud owner of a maintenance plan that begins tomorrow, and runs through June – and the start of Chicago training. I’ll be focusing on easy pace, so it’ll transition smoothly into the higher easy mileage of Hansons (I am using the Advanced Plan) while also adding in a sppedwork day and a long run (capped at the half marathon distance). For me, it feels so good to see a plan written out, and ready to complete, and I can’t wait to begin! So, are you a planner…or a spontaneous runner? I am a total planner! Right now, I am in flux too, having completed my 2014 goal in mid March. Now I am trying to stay focused on quality runs and have some fun pacing others in races and also working the Strides program at a local elementary school. I plan to meet with my coach soon to find out what’s next! Nice, Pam! You’ve been rocking it. I am lost without a plan. I am currently “training” for a 10 miler next week and a half the week after with no specific plan other than putting in miles on the road. It feels weird. I am in the mindset of treating the races as just another run as I am not prepared to “race”. Got to get back on track. I do much better with a plan in place too. When I don’t have a calendar in front of me with a list of what I’m supposed to run, I’m a slacker and just don’t run. I am definitely a planned runner. Nothing makes me feel more accomplished than marking off my daily workout on my planner!! After this weekend I really don’t have anything on the books for awhile so I know I am going to struggle.